Here at Distilled, we've often taken a keen interest in startups and how they have evolved overtime. One that we and many of the SEOs in our community have utilized is StumbleUpon, a free social media services site that's purpose is to help users discover new sites. 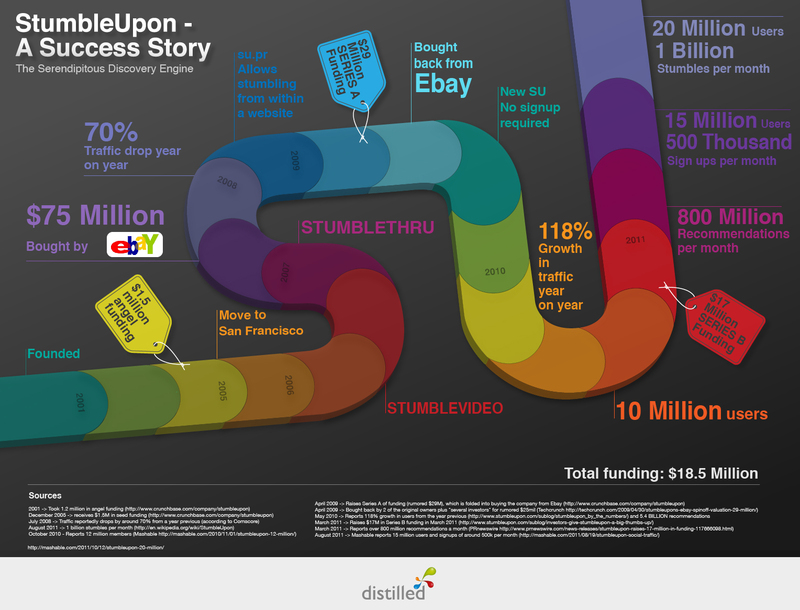 We've created this infographic to illustrate some of the highlights of StumbleUpon's success story. 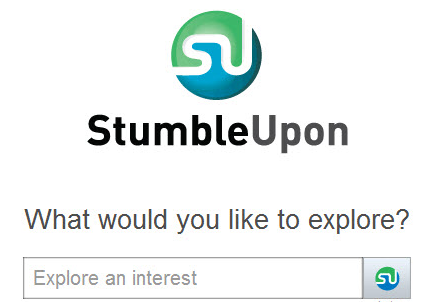 StumbleUpon was founded in November 2001 by Garrett Camp, Geoff Smith, and two other friends. They came up with 5 or 6 ideas for different products before settling upon StumbleUpon. In an interview with the BBC, Garrett Camp mentioned that when the site reached half a million registered users did he feel that the site became more of a career. The site caught the interest of angel investors, where it landed $1.2 million in funding and then in 2005, $1.5 million in seed funding. 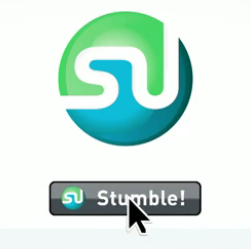 On October 24, 2011, StumbleUpon made changes to the site by deleting their user-generated content, HTML blogging, standalone blog posts, and ability to photoblog. All their previous blog posts converted from HTML to plain text and all photos were deleted. This was done to focus their efforts on their recommendation engine rather than expand to include blogging platforms. The general premise is that the Web has gotten so massive, that it is difficult to find relevant content without searching through pages and pages of results via search engines. StumbleUpon works by first having users download a toolbar and having users personify themselves by selecting topics and interests that pertain to them. Using a combination of the user's input and machine learning from the site's algorithm, the site then determines the type of content that the user would be interested in. To make it potentially easier, think of it as the Pandora of the Web's content. Users then click on a "stumble" icon on the toolbar to access a completely new, "random" site. The initial "random" site that is generated is one that the site's algorithm believes reflects the user's interests. Users then vote on the site with a "thumbs up" if they like it or a "thumbs down" if they don't. Users can also befriend other users on the site. In general, the more the user uses the site, the more data the algorithm has and thus, the smarter the algorithm gets. Overtime, it can act as a personal search engine that is especially tailored to the individual. 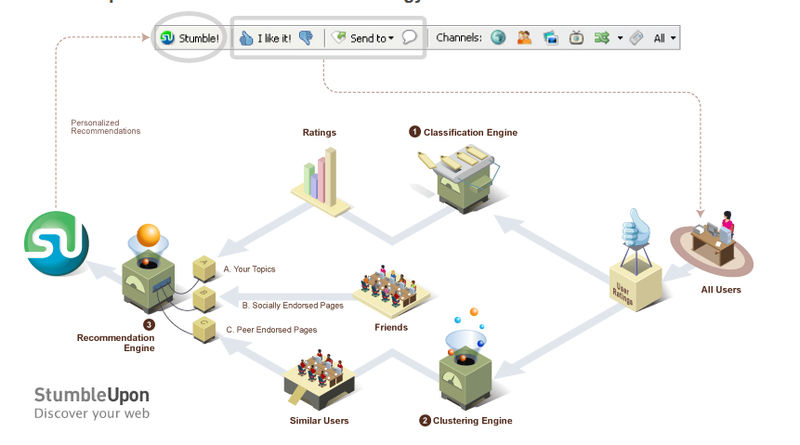 The algorithm behind StumbleUpon uses three data points to determine the type of new sites that users "stumble" across. The first is based off of the interests that users have identified as relevant to them. The second is based off of the sites that have been deemed as "thumbs up" and "thumbs down," which helps the algorithm identify other users who have exhibited similar voting behavior. The third is based off of the types of individuals that users have befriended on the site. It's clear through StumbleUpon's history and the history of many other startups that building a following and creating a successful business can take time and go through seemingly endless trials and tribulations - Should the startup provide more tools or focus on improving the singular product? To sell or not to sell? And even can this be a career? What's exciting for us at Distilled is watching the emergence of so many talented individuals continue to disrupt old methodologies of conducting business and revolutionize the digital world. We continuously look forward to seeing what the future will bring. *edit* Regarding the numbers raised, we received them directly from StumbleUpon. Because seed/angel funding is not counted as an official VC raise, the official numbers for StumbleUpon are $1.5M and $17M, adding up to $18.5M. The supposed $29M that they received to buy back the company has not been officially confirmed.